Post Pictures of Your Astrophotography Imaging Setup! Thread: Post Pictures of Your Astrophotography Imaging Setup! 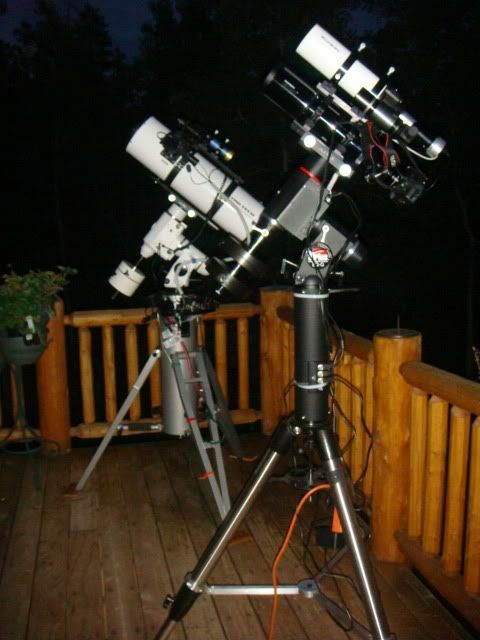 NEQ6 Pro Mount.Meade LX90 ACF 8" and lx90 8" emc, Canon 450D (Rebel XSi) 18-55 and 75-300 lenses. Canon 70DW 18-135 USM and sigma 70-300. 4000 lens kit. Orion Starshoot Autoguider. 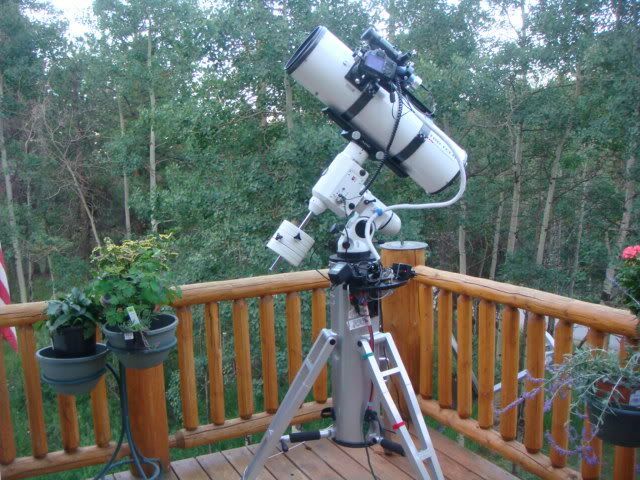 Skywatcher 102 x F5 guide scope/wide field scope. 10x10 shed with dome. Sky watcher sky adventurer mount. Okay, now that I finally have all of my gear, here is my current setup. I'm set on gear, but I need to get me a little folding table and dispense with the 2 chairs. It works for now though. I'm more concerned with getting proficient at tightening up my guiding. Used it to capture some very nice guided shots of Bodes tonight, but after about 5 minutes she's start slipping. Need to fiddle with the brain a bit and tinker with the settings. I also need to figure out how the hell to stack and process the pics, and then I'll throw them up on the forums. slalles, jimminCT and Hard way like this. -Canon 1000D, StarShoot Autoguider & Blue Fireball Elim-T 2"
This is my guy. The only one for now. A couple pics of my imaging setups. KevinDuch, rohitud and coltpeacemaker like this. Orion SkyQuest XX12i Truss Tube. Explore Scientific 127mm Triplet, Explore Scientific 127mm CF Triplet, Astro-Tech 10" f/4 imaging Newt, Orion EON 80mm, Explore Scientific 6" AR152, AP1100 mount, EQ6 mount, SBIG ST-8300+FW5, Baader LRGBHa, SBIG ST-4000xcm, Hap Griffin Modded Canon T1i. My Skywatcher Black Diamond 203/1000 + HEQ5 + Canon EOS 550D. Soon, a Meade DSI + guiderscope. The picture was taken at the last "star party" organized with other local astronomers. Capturing Jupiter. And the result, above. In between imaging sessions, right after M8 and before M16 on the same night (busy beaver! ).